Post webcam observations for December 2015 here. Observations should start with a date and ‘jst’ time (Japan Standard Time) and camera(s). Describe as best as possible what you see. Contribute data such as weather conditions, work activities, TEPCO or local news reports, radiation readings, earthquake activity, or any information that documents events occurring at Daiichi. Comments and analysis welcome. Help keep an eye on TEPCO's disaster site. (11-30-2015, 07:57 AM)piajensen Wrote: Thanks! YW Pia, haven't had too much to report on lately. I saw a few sparks on 11-29, then on 11-30 they did a spraying over r3. R3 still seems to be the biggest source of emissions. The vacuum tool continues to work on r1. The solid wall tepco put in is already leaning; they didn't want to stop the flow ahead of the plant because draining the area too fast would cause subsidence, now they might have flooding issues. Tepco announced they would remove the r2 roof next year to prepare for spent fuel removal; expect more sparks and steaming, r2 had the highest radiation readings. 12-1 The tepcam views are both still, no overtime work this evening. What we can't see on the tepcams are the spent fuel pools steaming or the three core melts churning out radiation. Enlarged sparks to enhance the neon colors. I agree Horse, R3 emissions are running high. Boat is still trolling around in the background and the R4 horizon view showed that multi-colored vapors with background fireworks filtered by Flowplayer. I think the vacuum crate they've been using is stirring up the beast. Glad CafeRadLab is here, you guys are doing a great job maintaining it. Hope that you and yours had a great holiday. Hi Cali, thanks for posting your observations and the kudos - Kudos to you, too - those are some exceptionally big sparks! Cali, wonderful, wonderful. The 18:11 white light flash in r1 looks like one I saw Halloween 2014 lighting up the r1 tent. Odd timing; a year and a month apart. Grabbed 34 red flashes from 18:57 – 19:47 some big, some small, different shapes. Here's two at the start and one at the end. Cali and Horse - Thank you for your ongoing attention to the webcams and events and for your reporting out. Much appreciated. Just on brief review, I see quite a few significant sparks. I think, not sure because I don't watch as much as you, but - it seems that the sparks are generally larger than those in the past... I think that because I usually have to look in a more concentrated fashion at the sparks in your collections and those newest sparks seem to jump right out. Easier to see. (12-02-2015, 03:42 PM)piajensen Wrote: Cali and Horse - Thank you for your ongoing attention to the webcams and events and for your reporting out. Much appreciated. Just on brief review, I see quite a few significant sparks. I think, not sure because I don't watch as much as you, but - it seems that the sparks are generally larger than those in the past... I think that because I usually have to look in a more concentrated fashion at the sparks in your collections and those newest sparks seem to jump right out. Easier to see. Pia, don't know how to quantify the difference in intensity; bright or dim is still subjective as is the color. The difference in variety; Cali and I started giving them nicknames. The sparks on 11-30 pm had more variety and intensity than a slow night of plain white sparks. Consider that the white flash in the r1 tent hasn't been spotted since 11-1-2014 when an explosion of those flashes occurred over three nights. This year's single flash was followed by the pulses of red flashes over r1 and the jump in spark count. We're able to document the event better than we could a year ago at the old enenews webcam forum. It’s been an interesting year; losing the enenews webcam forum, the attacks and disinformation left in the comments, airing the dirty laundry, a widespread active effort to silence or discount any unsanctioned research or researcher. The uncontained nuclear fire and radioactive water and vapor releases at Daiichi dirty the clean reputation of the nuclear power industry. Thanks for giving enenews outcasts a place to post our pictures of the disaster site. What's your guess or anybody else as to what the 'red flashes' on R1 are? The stills look like a large gaseous flame. (12-03-2015, 02:29 AM)Chasaha Wrote: What's your guess or anybody else as to what the 'red flashes' on R1 are? Hi Chasaha, yes, the stills make it look like a gaseous flame, but it wasn't continuous. The flashes are like the sparks lasting for 2 frames. Some of the stills with the same times are numbered, trying to show the variations within four or six frames. My guess, the first white flash unleashed the fury, plumes of vapor rise and get blown away at the open roof, subsequent weaker 'red' flashes reflect light off the vapors. Did you notice the pink haze at daybreak? My guesses brought me a lot of grief over at enenews so I usually just present evidence and let people see what they want to see. Thanks for asking, my wild theories of ongoing sub-criticalities could be wrong and I've only been watching for a few years so I like to read what others are seeing. Anybody else? Thanks for asking, my wild theories of ongoing sub-criticalities could be wrong and I've only been watching for a few years so I like to read what others are seeing. Anybody else? My take is that criticalities and sub-criticalities are ongoing. How can there not be such activity when that is what radiation does... based on the type of environment the material is in, what it's "relating" to - I think it's accurate to say that one nature of radiation is to interact with it's environment and respond according to the types of materials it is interacting with. One type of response is criticality. Sub-atomic responses are bound to occur. Especially when mineral / metal and chemical laden seawater is thrown on the mess. I'm no physicist, so please correct me if I'm off in my best guess analysis. (12-03-2015, 07:36 AM)piajensen Wrote: My take is that criticalities and sub-criticalities are ongoing. How can there not be such activity when that is what radiation does... based on the type of environment the material is in, what it's "relating" to - I think it's accurate to say that one nature of radiation is to interact with it's environment and respond according to the types of materials it is interacting with. One type of response is criticality. Sub-atomic responses are bound to occur. Especially when mineral / metal and chemical laden seawater is thrown on the mess. Neither am I, here's a wiki entry to correct my phrasing. Many criticality accidents have been observed to emit a blue flash of light. The blue glow of a criticality accident results from the fluorescence of the excited ions and atoms (or excited molecules) of air (mostly oxygen and nitrogen) falling back to unexcited states, which produces an abundance of blue light. This is also the reason electrical sparks in air, including lightning, appear electric blue. The smell of ozone was said to be a sign of high ambient radioactivity by Chernobyl liquidators. This blue flash or "blue glow" is often incorrectly attributed to Cherenkov radiation. It is a coincidence that the color of Cherenkov light and light emitted by ionized air are a very similar blue as their methods of production are different. Cherenkov radiation does occur in air for high energy particles (such as particle showers from cosmic rays) but not for the lower energy charged particles emitted from nuclear decay. In a nuclear setting, Cherenkov radiation is instead seen in dense media such as water or in a solution such as uranyl nitrate in a reprocessing plant. Cherenkov radiation could also be responsible for the "blue flash" experienced in an excursion due to the intersection of high-intensity gamma radiation with the vitreous body within the eyeballs of those in the presence of the criticality. This would also explain the absence of any record of blue light in video surveillance of the more recent incidents. A blue flash might look white when seen thru the tent. The flash reflecting off the vapor gave it a different color, reddish. I'll try to refer to it as a blue flash to identify it with a criticality accident. Puff of smoke coming from the left side of cam4 on 12-4-15. 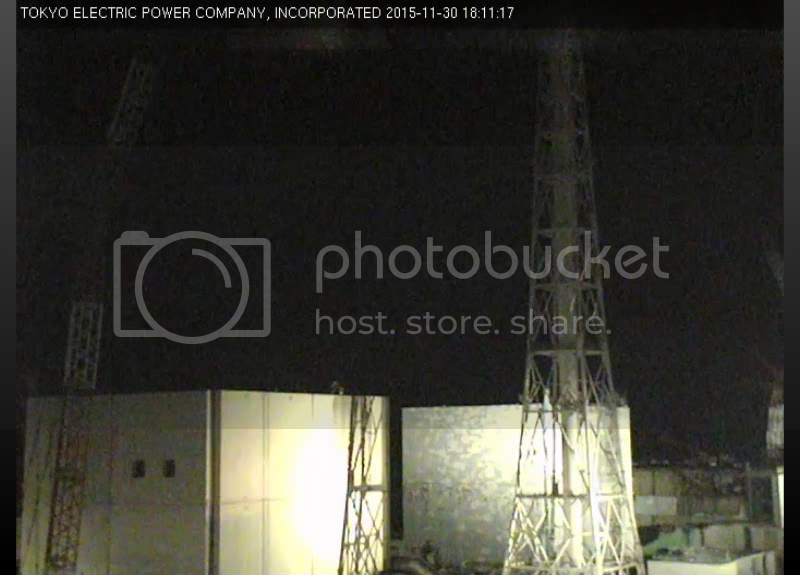 Tepco was really working the pixels to reduce clarity. Quote: "Many criticality accidents have been observed to emit a blue flash of light. The blue glow of a criticality accident results from the fluorescence of the excited ions and atoms (or excited molecules) of air (mostly oxygen and nitrogen) falling back to unexcited states, which produces an abundance of blue light. Cherenkov radiation could also be responsible for the "blue flash" experienced in an excursion due to the intersection of high-intensity gamma radiation." Showing incredibly heavy emissions at night these days on cam1, JNN cam is heavy also. I'm sure you've also noticed a thick cloud lingering over R3, it seems to be higher and not sure which area it's coming from so looking at cam4 perhaps heavier emissions are starting to come from the R4 extension light room. I look for the areas that have intense neon colors when zooming in between 400%-800% and see the R4 extension rooftop corner emitting blue bursts. Could this be where the thick cloud is coming from? The new webcam Flowplayer has larger pixels that produce less sharpness & clarity unfortunately but the larger pixels enhance the colors and make them easier to see. I consider intense neon colors a hot spot, identifies an area of interest..
10th cam4 blue burst over R4 extension bldg. Hi Cali, I see you caught a double spark and emissions from the R4 extension rooftop corner. I think there's a vent on the north side of that r4 extension. I've seen lights on in the early evening recently in that extension building, some activity still going on in r4. The venting is visible in high humidity when the vapor hangs in the air. In cam4 the vapor looks like it comes from r3 and over the r4 extension but in cam1 the vapor is to the right of the r3 pit so it must be coming from the north side of r4. In the cam1 view, R3 is constantly steaming and vapors rise over the r3 pit, heavy at times, but the vapor that brightly reflects the light is usually off screen to the right of the r3 pit. I think we see occasional venting out of the north side of r4. Many people argue about whether the r4 sfp was burnt up or emptied. I suspect that the reason TEPCO’s storyline never made sense was because of military operations being secretly conducted and covered up. What TEPCO did admit was that the pool had broken fuel rods in it and the pool leaked. One of the biggest arguments on the old webcam forum was about the webs, plasma or water caustics. A vapor cloud of ionizing gases could be called plasma in dark mode but any dim glow is purposefully concealed by the bright equipment lights. The equipment lights reflect off the vapor clouds and we see the vapor curl up over the buildings. When the vapor cloud drifts near the camera and sticks to the lens we see the dancing webs of water caustics. I've seen puffs of smoke drifting in front of cam4 like you've captured in the 12-4 daytime shot. My guesses include; vapor from the csfp, debris burning, or an out of tune diesel engine. I’m still thrilled that you caught a flash in r1. I’ve wondered what the flashes were since I first saw them last year. The ones you caught weren’t as bright or intense and didn't last as long but the flashes had the same characteristics, flashing on for just two frames. This event showed the flashing from above the roof so I guess it was reflecting off of the vapors, smoke, or dust clouds coming out of r1 before they wind carries them away. TEPCO was working on the muon detector last year at the time so I thought the flashes may be related to that, so what were the flashes this time? Last December I saw a flashlight shine briefly in the r1 tent. Once I watched a small part of the lower left panel light up with shadows moving from one side to the other and back, lasted maybe 3 minutes. If workers are going inside r1 they wouldn't want to stay for long. Its possible that TEPCO has some shielded heavy equipment puffing smoke, stirring up dust clouds, or flashing bright lights in there but they haven't bragged about it to my knowledge. Here’s a grab from last year. Notice the bright golden glow at the top of the one open roof panel. The flashes had a bluish hue when they were most intense and the way they strobed wasn't like an equipment light or an arc welder. majiasblog.blogspot.com.au/2015/12/location-of-pixilation-source-on-tepco.html - that worked... now full edit to link the url - okay, that worked. wonder why the system was only showing me quoting another, twice instead of posting the Majia info... it did it yesterday and again this morning.